Every state in the US produces wine. Why not taste them? For 50 weeks We will do just that…welcome to the United Slurps of America. Week seven: it’s Kentucky. More noted for Bluegrass and Bourbon than wine, Kentucky was one of the states that We had absolutely no idea what to expect. Both of Us being big fans of Maker’s Mark, We knew they could produce a good whiskey. But wine? We didn’t know where to begin. 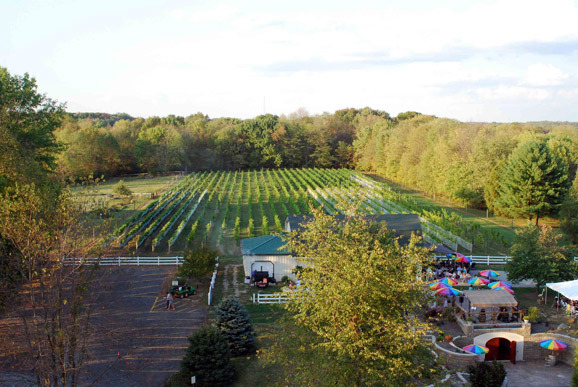 Lucky for Us, Kevin Keith, of the wonderful Under the Grape Tree wine blog, contacted Us a few weeks ago, expressing his interest in the Slurpin’ USA project. He is well versed in all things wine and had great insight on Kentucky. We thought this might be one of the states handcuffed by archaic, inane wine shipping laws, but Kevin got the wines to Us safely (and hopefully legally). Here are Our takes on the wines, with our terrific co-blogger Kevin chiming in. 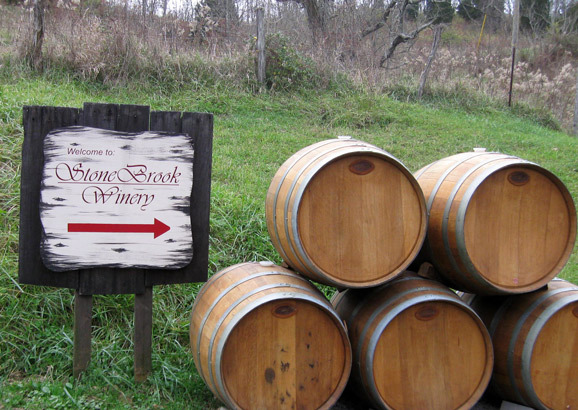 It’s Our own little 3-stop Kentucky Bourbon Wine Trail, featuring Elk Creek Vineyards, Jean Farris Winery, and StoneBrook Winery. She said: Golden pale yellow color. On the nose: lime, unripe pear, wet stones, green herbs–parsley, and a saltiness. Can you smell salt? I do. In the mouth there is a lot of acid, making it fresh and lively. Again green notes: like fresh cut grass mixed in with the richness of pear. Has a silky, creamy mouthfeel. I imagine this is a terrific food wine with its mix of acid and lush fruit. Reminds me of a fruitier Muscadet or a Picpoul. Can imagine enjoying the wine with oysters, ceviche, sushi, squash blossoms stuffed with ricotta, arugula salads…the wine makes me hungry. Great bargain for $9.99, would buy it by the case for summer–if I could find it in California. He said: Apple, melon, pear and cut grass on the nose. In the mouth it’s a mix of creaminess and high acid, which I’m not really used to. But, wow, it’s really good. There is also some spice, but not the typical spices; maybe mustard seed or dill. Would be great on a warm day with a salad or seafood in the garden. Really, surprisingly good. Under The Grape Tree said: Yeah, I know this is sweet. A bit of an indigenous take on Riesling, this hearty white has some honeyed apple and pear notes, some spicy mineral, and a bit of white flower. It has some acidity to it, and of course, what many folks note as a “foxy” character – a bit wild or feral quality, as does most grapes from these parts. She said: Golden yellow and appears thick on the swirl. On the nose the wine is very floral and rich like peaches and cream and an Orangesicle with some mineral undertones and a big waft of honeysuckle. And is that a hint of corn syrup? We talked it over (breaking our “no talking” rule–yep, We both get corn syrup.) The mouthfeel is lovely, creamy, and viscous. On the palate the wine is very floral with apricot and a dry, stoney finish. Reminds me of burleed grapefruit. There is a nice balance of fruit/acid/minerals. I imagine this is another great food wine. It manages to be rich but with a clean, fresh finish. Love it. He said: It seems as though every Viognier I am tasting lately is testing my aversion to the varietal. This wine is slightly cloudy and very fresh on the nose. Floral notes, apricot…it smells like Viognier. There is also some heat on the nose and I just looked to see the wine is 13.9% alcohol. In the mouth there is nice acid, again mixed with creaminess, oak is definitely present. It’s very creamy. It’s full-bodied, balanced; whoa, I love it. I’m tasting corn tortilla chips. Odd, but totally there. That said, this wine would be great with Mexican food, maybe even nachos. Exceptional, I totally love it. Under The Grape Tree said: Not quite that of the Rhone, but the general characters of peach and honeysuckle are present, as is a bit of orange blossom, apricot and mineral. The foxy notes are there too, but with some needed restraint. A surprising white wine with some body and balance. She said: Deep, pretty garnet and translucent around the edges. On the nose: minty, green peas and asparagus with smokey cedar notes. Hefty swirls blow off some of the vegetal characteristics. The wine is quite sharp and tart with dark cherry flavors. Has a freshness, but also a chemical note like bing cherry air freshener. The aromatics also remind me of the botanicals of gin. Medium, soft tannins. I thinks it’s a really interesting wine. He said: Hmm. This smells like Vick’s Vap-o-rub. Mint & eucalyptus with some tobacco thrown in. In the mouth there are flavors of fruit (cherry, blackberry, raspberry) in this very juicy wine. It’s light, but there is some presence in the mouth. Not really into it. I can’t really say that this is a “bad” wine, it’s just not for me. This is another thing I love about doing this project; I am learning about wine in general, but also figuring out which varietals I enjoy from a state I wouldn’t even assume produces wine. Under The Grape Tree said: Being a huge Cab Franc fan, when good friend Terry Shumrick – winemaker for Stonebrook – told me he had a Cab Franc made from grapes grown in Kentucky, I thought he was crazy. Then he told me the price and I thought he was a lunatic to boot. Though it is not all that tannic, nor does it have a lot of body to it, it is really drinkable, with smooth blue fruit notes and hints of spice and mocha. The tannins are soft but firm, and the finish is really nice. And it is minus all the green bell pepper character you get in a lot of cheap – BAD – Cab Francs out there. This is a really nice find, especially from Kentucky. 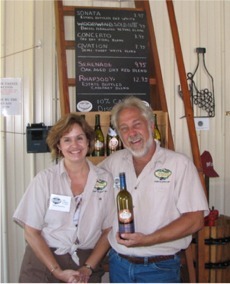 We said: First off, a big thanks to Kevin for supplying and shipping Us the wines to sample. 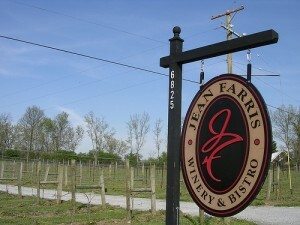 He also sent Us background information on the wineries and insights into the growing regions of Kentucky. Wineries and Winegrowers of KY: this guy is a great advocate for your state. It was also a treat to share tasting notes with Kevin. We’ve been a fan of his blog long before We started our own. Check it out…frequently. Every state in the US produces wine. Why not taste them? For 50 weeks We will do just that…welcome to the United Slurps of America. Week six: it’s Georgia, y’all. Lots of Georgia has been showing up at Her door over the last week. First up was a prettily packaged box of wine. And a few days later there was another Georgia import: Joe, the Suburban Wino. He was in our lovely state for vacation and staying just down the coast in Laguna Beach. Both the wine and Joe were a delight. Georgia, represent. 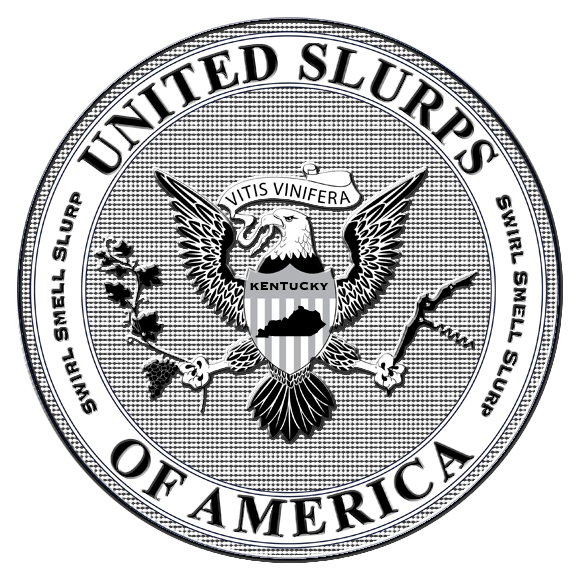 We’re just six weeks in, but already The United Slurps of America has been a terrific tasting adventure. Once again We found ourselves with wine made from a far away state and, in the case of the white, made from grapes neither one of Us had ever tasted (and twisted our tongue pronouncing: say-vul? see-vel? chez-val?). Tasting in person with Joe was a bonus. We’ve been a fan of Joe’s blog since We began our own blogging adventure. When he said he was anxious to get out and explore and how about getting together We said, yeah, come on up to gritty, hipster Hollywood and let’s taste some wine. Joe rented a car and drove up, arriving on a beautiful Spring morning. We hastily made introductions and then got down to business. Glasses were gathered and corks popped. We have a pretty regimented way of tasting wine (examine the color, swirl, smell, slurp, linger–and no talking) all of which seemed to amuse Joe. He’s much more laid back and experiential in his tasting and admitted to rarely taking notes. 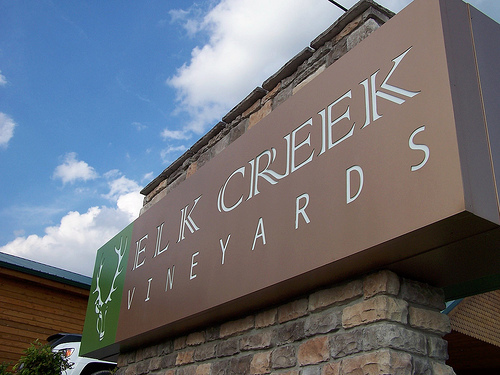 While We went through our ritual he filled us in on some facts about Georgia wine in general and Persimmon Creek in particular, having recently visited the place. 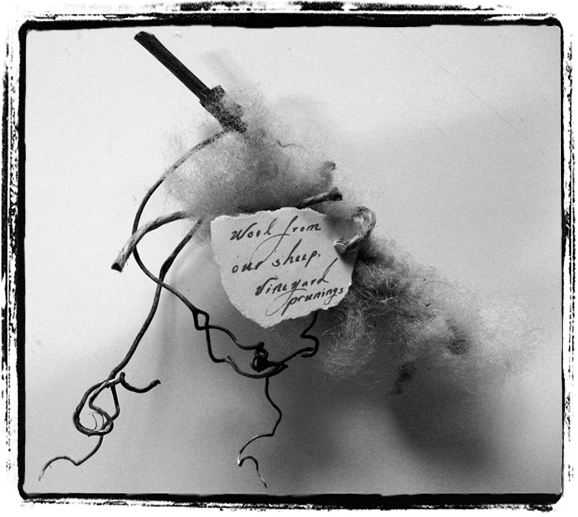 We were intrigued by the winery in light of the fanciful package they sent Us which included a piece of wool from their sheep and vineyard prunings. Joe told Us that there were about 30 of the cute, fuzzy animals on the property. We continued to sip the wines and Joe joined us in scribbling down some notes, our collective reviews are below. She said: The color is very pale, translucent yellow with a greenish hue. The nose is quiet: a little bit of grass and obvious acidity, which is confirmed in the mouth. With the acid are subtle flavors of cucumber and a mild gin and tonic. The wine is bone dry and quenching with a sweet tart kind of mouth puckering sensation. Also get hints of lime (perfect garnish for the g&t) and wet stones/oyster shell. Imagine enjoying with a grand le plateau de fruits de mer. Not a deep thinking wine, but highly enjoyable, food friendly, and a good value. He said: I’ve never had a Seyval Blanc, this is really why I love Our project. It’s very, very pale (almost clear) greenish-yellow. On the nose is citrus, cooked pear, apricot and white peppercorn. Very acidic and mouth-drying, very reminiscent of Sauvignon Blanc, I assume these grapes are cousins, or half-brothers–or however grape families work, they are closely related. I am getting only slight hints on the palate of the fruit I discerned on the nose. I enjoyed this wine and it’s a great value for 13 bucks. Suburban Wino said: very pale in color…nothing overwhelming on the nose; some subtle melon, maybe some cucumber. Getting a little bit of citrus, some mineral, and some herbaceous- perhaps “grassy”- elements that I tend to get in a lot of Georgia wines…let’s call it terroir. I then got some really interesting petrol and ginger notes, until I realized that I’d accidentally grabbed the white wine from Iowa from the previous week. Oops (but way to go, Iowa). Between the cheeks, I found it to have some decent acidity. It was a little hollow in the palate, but I’ll be a homer and suggest that will improve as the young vines (5-10 years old) develop. She said: In the glass the wine is translucent around the edges and a muddy purplish garnet. On the nose it smells dusty with vegetal/string bean aromas. On the mouth I detect the burnt wood flavors of American oak, white pepper, and green veggies…there is a fresh produce quality. Quite tart with a lingering cinnamon-like aftertaste. Not my style, but some may say typical of a Cab Franc (and I have had many I’ve enjoyed, so my mediocre review is not because of the grape). He said: Purpley and if in Photoshop would be about 75% opacity. On the nose there is not much fruit, but spices. Peppery. Some wood, maybe blackberry. I am getting tar, like a freshly tarred street–which may be a smell of the past for me because it looks like Los Angeles is about to be bankrupt and won’t be fixing any streets in the near future. Savor the smell of a functioning government. In the mouth there is more fruit than on the nose. Peppery mouthfeel with light tannins. She doesn’t like it, but I totally do. This bottle is mine. Suburban Wino said: this nose changed from the last time I tasted it. Maybe my nose was on west coast time. Anyway, I expected a lot of toast from the 1/3-1/3-1/3 French-Hungarian-American new oak barrel aging regime. This time, however, I got a telltale note of jalapeño/green pepper, some red fruit- maybe raspberry, a bit of cocoa, and a freshness/cheesiness (that throws folks off) that I tend to get in Loire Cab Franc and Beaujolais and Gamay-based wines. Rolling around in the mouth, I found it a little thin and flabby (there was some acidity there, but I could use some more). The fruit flavors, along with some Italian canned tomatoes (more bitterness that home grown) came through on the palate. I think this would be a darn good food wine if the acidity was dialed up a notch. We said: After tasting the Georgia wines the three of us went to a favorite neighborhood spot for lunch: The Hungry Cat. 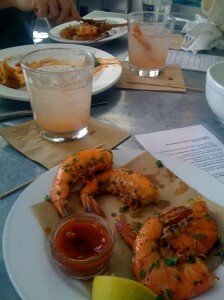 The seafood is incredibly good here…and so are the fresh fruit cocktails. We indulged in peel your own shrimp, squash blossoms stuffed with crab, a lobster roll for Him, a crab cake sandwich for Her, and an oyster po’boy for Joe. What a great day. We later marveled about the afternoon and our whole wine tasting adventures in general. It’s always a treat for a package to arrive. This feeling is heightened when said package is wine. The feeling is heightened tenfold when said package contains free wine. Opening the box from Persimmon was, by far, Our favorite box-opening experience since we started USA. There were so many thoughtful extras in the box–and wow– Mary Ann’s handwriting. She wrote Us a personal 3-page letter with the most beautiful handwriting We have ever seen. Thank you, it’s so nice when people care. And then there is our new friend the Suburban Wino. This was Our first face-to-face USA tasting, and it was a complete pleasure to spend an afternoon with Joe. A quick aside, We will try to resume making the video trailers for the USA posts, but we have had a busy couple of weeks and those were one of the causalities of our schedule. Plus, He couldn’t figure out a song for Iowa last week.